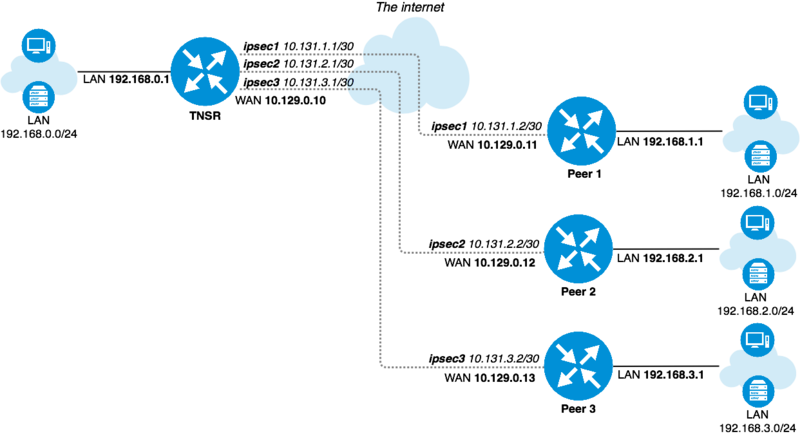 HQ (hub) with 3 branch (spoke) sites, with secure interconnection between thier local networks. One of the branch routers is assumed to be BGP capable. Internet access for one of the sites should be provided through the hub node. The information in this section defines the local configuration which is covered in this recipe. These input values can be substituted by the actual corresponding values for a real-world implementation. General IPsec settings are the same for every node. It is assumed that devices have generic default setup, do not have any existing configuration errors, and are ready to be configured. In this scenario every device obtains its own static IP address on its WAN interface from an external lab gateway which is not a part of the considered scenario. Setup LAN interface with static IP address. Setup WAN interface for obtaining an IP address via DHCP. This could also be a static setup, following a similar form to the LAN settings above. This section describes minimal IPsec and routing settings in order to obtain secure interconnectivity between LAN networks for every device. This document assumes that devices have generic initial setup successfully completed and are able to reach each other via WAN network. This section describes routing setup. This scenario assumes one of the pfSense IPsec peers, Peer 1, uses a dynamic routing protocol (BGP) and the remaining two IPsec peers use static routing. This is a requirement for the zebra management daemon to run, this password is not used by clients. In this case, it is the LAN interface IP address, assuming it will be always be available for routing between LAN subnets. At this point, routes to 192.168.0.0/24, 192.168.2.0/24, and 192.168.3.0/24 will be learned by BGP and installed in the routing table. If it is not so, check Status > FRR on the BGP tab. That page contains useful BGP troubleshooting information. Additionally, check the routing log at Status > System Logs on the Routing tab under System. To allow connections into the local LAN from remote IPsec sites, create necessary pass rules under Firewall > Rules on the IPsec tab. These rules would have a Source set to the remote LAN or whichever network is the source of the traffic to allow. For simplicity, this example has a rule to pass IPv4 traffic from any source to any destination since the only IPsec interface traffic will be from 192.168.0.0/22. TNSR will perform NAT for this peer, so outbound NAT is not necessary. It may be left at the default, which will not touch IPsec traffic, or outbound NAT may be disabled entirely which will also prevent LAN subnet traffic from exiting out the WAN unintentionally. This section describes minimal routing and NAT settings which provide access to the Internet for one of the remote networks. In current case this is Peer 1 that exchanges routing information with TNSR via BGP. This document assumes that devices have IPsec setup successfully completed, able to reach each other via IPsec tunnel using path information from the dynamic routing protocol. Setup NAT for remote network. In this case PAT is used. # defining NAT inside interface for internet traffic sourced from Peer 1. Setup access to the internet via IPsec VTI interface with a policy-based routing rule. VTI on pfSense does not support reply-to. Despite this policy routing rule on Peer1 which covers all traffic, there must also be kernel routes to remote LANs for the return traffic to find the way back.